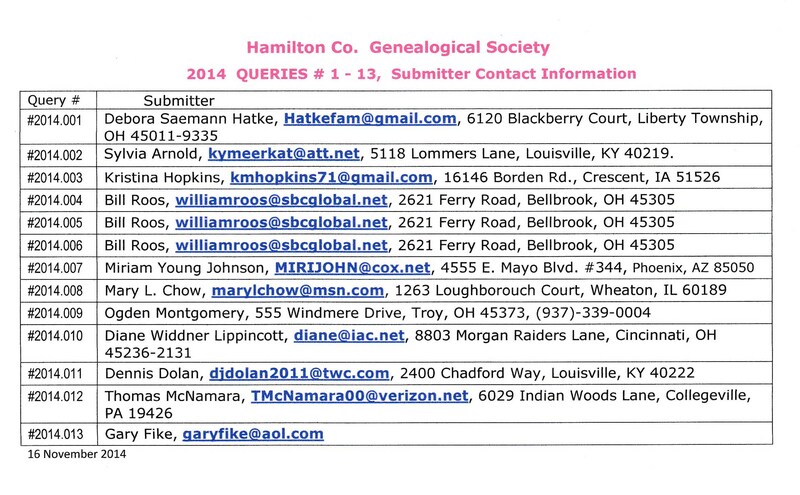 Genealogical queries with connections to Hamilton County were published in The Tracer from 1981 through 2014. Because there is a Surnames database on this website, queries are no longer published in The Tracer. Only members can make additions to the Surnames database. See the Using the Surnames List and Submitting Your Surnames pages for more information. The queries for 2013 and 2014 and the indexes from 1981 to 2013 listed below will remain here for future research. 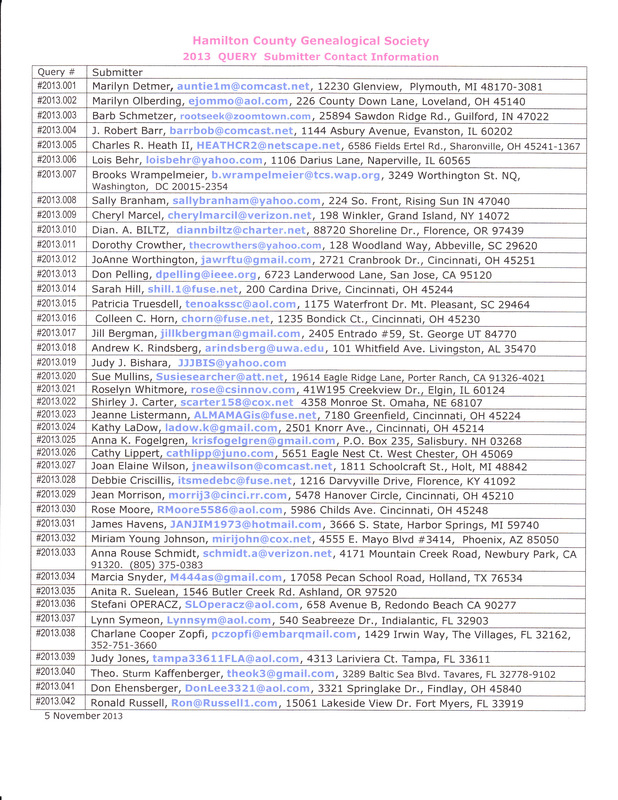 In the query list, note the Query # to get the submitter contact information at the link on the right. Addresses are displayed in a graphic image so marketers cannot intercept them for junk mail purposes. Click on the submitter's image to enlarge it. 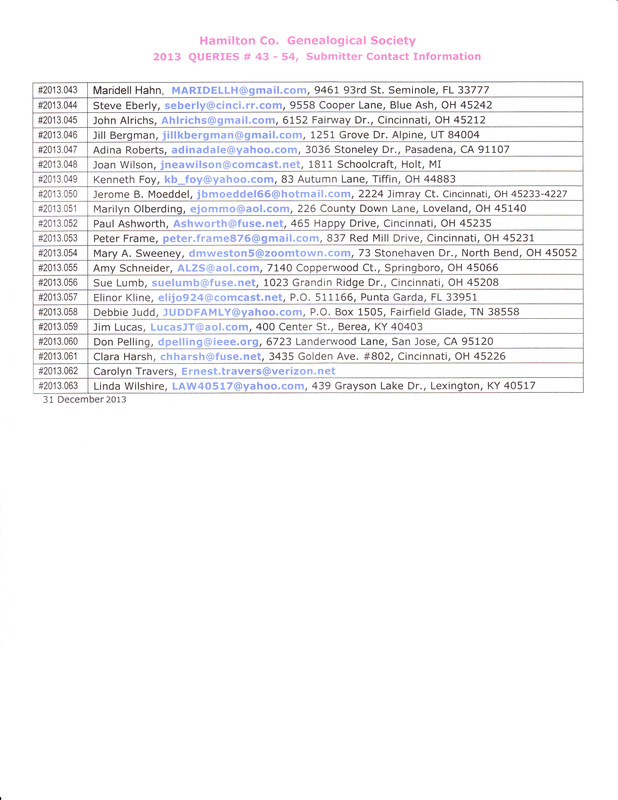 Alphabetical indexes to surnames posted in the HCGS quarterly journal, The Tracer, from 1981 through 1986, 1988 through 2005, and 2009 through 2013, are available here. Note: African-American names marked with (A). H Personal biography; pioneers, record extracts, schools, deeds, etc. L Lineage societies - First Families, Settlers & Builders, DAR, German, Irish, etc. N Non-USA birthplace or records of this name outside of US - Germany, England, Ireland, etc. S Society, club, fraternal group members, or not another code - GAR, DPV, etc. X Other: portraits, photography, memorial, public official, witness, etc.